Crews are working this week to paint new bike lanes along Rolling Hills Drive. Some changes are coming to the bike route between Butterfield Trail Elementary and the Razorback Greenway. 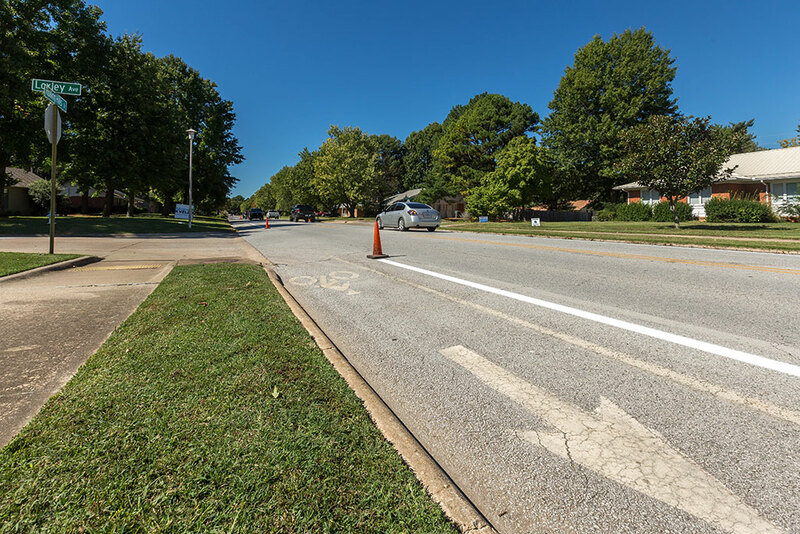 Bike NWA has partnered with the city on a pilot project to add bicycle safety improvements to the existing bike lanes on Rolling Hills Drive and Appleby Road. The work is funded by a grant from the Walton Family Foundation, and design for the project comes from local firm Active Planning + Design. The proposal includes several features, like narrowing vehicle traffic lanes and increasing the width of bike lanes in some areas, adding rubber boundary blocks, flexible bollards or ceramic traffic buttons to separate cars from bicycles, painting new street markings, and making changes to a few intersections. The new infrastructure will be in place for up to a year. During that time, officials will evaluate usage and public opinion to decide whether to convert the facilities to a more permanent status. Officials will soon release a survey asking anyone who uses the corridor, especially people who ride bikes, to weigh in on the proposal. Volunteers are needed to help add the new infrastructure, which is tentatively scheduled for installation Nov. 12-16. 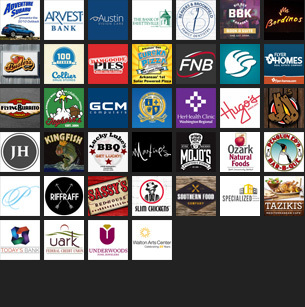 Volunteer signups will be available at bikenwa.org within the next few weeks. Preliminary plans for Rolling Hills Drive include narrowing the vehicle traffic lanes from 11.5 feet to 10 feet, increasing the existing bike lanes from 5 feet to 6.5 feet, placing raised rubber buffers at 10-foot intervals to separate cars and bikes, and installing vertical flex bollards at each street intersection. Various street markings are also proposed. The south bike lane would end before it reaches the intersection at Old Missouri Road to leave enough space for right- and left-turn lanes for vehicles. Bike traffic would be re-routed onto the sidewalk to connect with the crosswalk over Old Missouri Road which joins the eastern multi-use path that heads toward Butterfield Trail Elementary. The proposal calls for maintaining bike lanes through the intersection at College Avenue as bicycle traffic enters and leaves Fiesta Square. Currently, the bike lanes end during the approach from Rolling Hills, but by reducing the width of the bike lanes and vehicle lanes, officials say there’s room for both cars and bicycles. The existing 22-foot-wide entrance to Fiesta Square would be reworked to include a 10-foot vehicle lane and an 8-foot bike lane with a 4-foot buffer to separate cars and bikes. 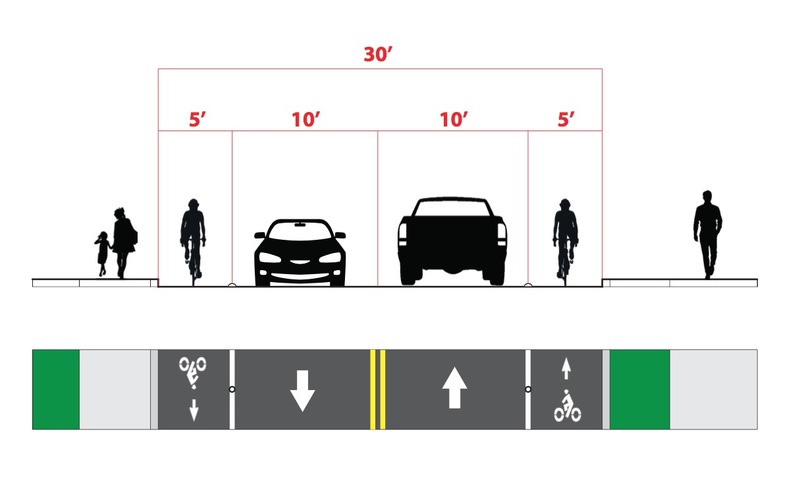 The two 11-foot vehicle lanes exiting the shopping center would be reduced to 9 feet to make room for a 4-foot bike lane leading onto Rolling Hills Drive. As traffic moves through the Fiesta Square parking lot towards Appleby Road, a two-way cycle track with vertical bollards would provide separation of bikes and cars. Preliminary plans for Appleby Road include adding ceramic, reflective traffic buttons at 15-foot intervals along the existing painted stripe that lines the 5-foot bike lanes on both sides of the road. The current vehicle travel lanes are 10 feet wide, so no reduction in width is proposed along Appleby, but the project suggests east-west stop signs at the intersection of Bishop Drive. 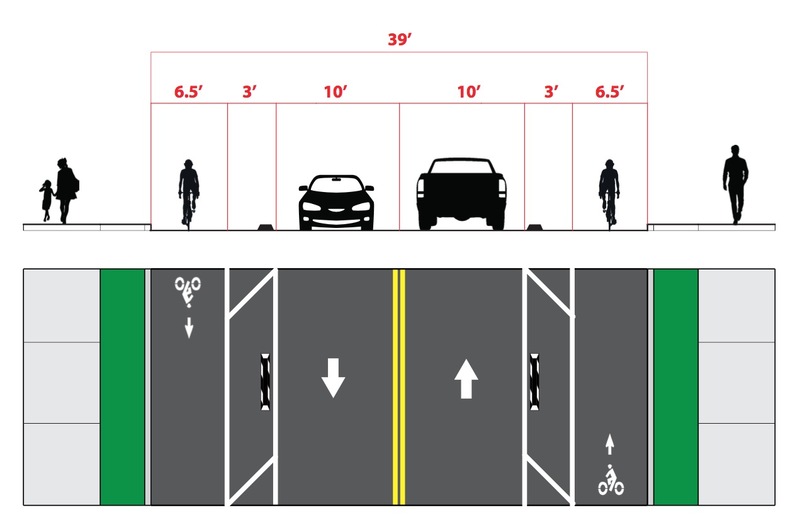 Bikes entering Fiesta Square from Appleby will shift into the Goodwill parking lot through a 5-foot protected lane with a 3-foot buffer that uses vertical flex bollards at 10-foot intervals. After crossing Appleby, bikes will use the cycle track described above.